【UPGRADED 2 Speed】Upgraded 2 adjustable speed setting, providing more power in tough areas to meet your needed! 【Ultra-High Capacity】Built-in 2000mAh Li-battery. Last for 4 hours after fully charged. Rechargeable and cordless design facilitates your using. 【Ceramic Detachable Blade】Sharp and never overheat when working. 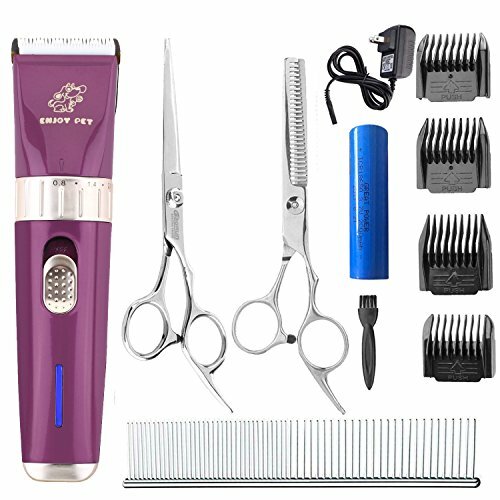 There are 5 adjustable blade sizes (0.8mm, 1.1mm, 1.4mm, 1.7mm, 2.0mm), just turning the ring of the clipper for different type of hair. 【Ultra-Quiet Design】Low vibration and low noise within 50-60db. With Perfect blade adaption and silencer technology to reduce the friction between the blades, effectively reduces the noise, makes pets grooming easier and enjoyable. 【Sweet Reminder】Latest Dog Grooming Clippers with LED indicator light. Blue light will show up when working, red light showed up indicates the battery is running low.